"We're Seeing Things We've Never Seen Before"
Ofman and his Goddard colleague, Barbara Thompson, spotted these waves in images taken on April 8, 2010. These were some of the first images caught on camera by the Solar Dynamics Observatory (SDO), a solar telescope with outstanding resolution that launched on February 11, 2010 and began capturing data on March 24 of that year. That these "surfer" waves exist in the sun at all is not necessarily a surprise, since they do appear in so many places in nature including, for example, clouds on Earth and between the bands of Saturn. Ofman says that despite the fact that Kelvin-Helmholtz instabilities have been spotted in other places, there was no guarantee they'd be spotted in the sun's corona, which is permeated with magnetic fields. "I wasn't sure that this instability could evolve on the sun, since magnetic fields can have a stabilizing effect," he says. "Now we know that this instability can appear even though the solar plasma is magnetized." Seeing the massive waves suggests they can cascade down to smaller forms of turbulence too. Scientists believe that the friction created by turbulence -- the simple rolling of material over and around itself -- could help add heating energy to the corona. Humongous waves of hot plasma roiling on the surface of the sun appear to be moving at speeds as high as 4.5 million miles per hour, a new study has found. The waves are so huge it would take up to 16 Earths, end-to-end, to match them. It's the first unambiguous evidence that the sun's lower atmosphere contains such superfast "magnetosonic waves," scientists said. The fast waves have velocities of 2.3 million to 4.5 million mph, periods in the range of 30 to 200 seconds, and wavelengths of 62,000 to 124,000 miles, equivalent to stacking between eight to 16 Earths on top of one another. Scientists discovered the waves with the Atmospheric Imaging Assembly instrument on NASA's Solar Dynamics Observatory (SDO), dedicated to observing the sun from orbit around Earth. 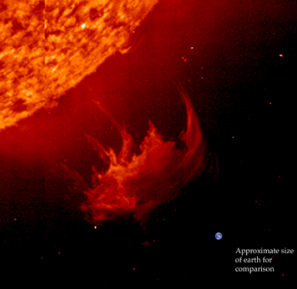 Waves on the sun are produced when a flare or eruption on the solar surface kicks up hot plasma, similar to ripples in water produced when a rock is dropped into a still pond. Scientists have observed slow-moving waves on the sun, but fast-moving waves, which were also predicted by theory, had so far gone undetected because previous space telescopes could not take pictures rapidly enough to image these fast waves. "They seem to be a common phenomenon," said Karel Schrijver, principal physicist at the Lockheed Martin Solar and Astrophysics Laboratory in Palo Alto, Calif., in a statement. "During the first year of the SDO mission, despite the sun being relatively quiet, we have seen about a dozen such waves. Although their exact trigger mechanism is currently under investigation, they appear to be intimately related to flares that sometimes exhibit pulsations at similar frequencies." Waves such as these are believed to be responsible for many fundamental yet enigmatic processes on the sun, such as heating the corona to millions of degrees, accelerating the solar wind, triggering remote eruptions and delivering energy and information between different parts of the atmosphere. By observing these waves, scientists hope to better understand the solar physics of such processes and their consequences on near-Earth space and the terrestrial environment. "This discovery and analysis is very significant because we are witnessing phenomena of which we were previously unaware," said Alan Title, principal investigator of the Atmospheric Imaging Assembly at the Lockheed Martin lab, who first noticed the fast propagating waves in routine SDO movies. "In light of this discovery, the more we look at solar flares, the more of these waves we see, and as observation and analysis lead to insight, the better we will understand the processes involved." Stanford University scientist Wei Liu, a research associate at the Lockheed Martin laboratory, presented the findings Wednesday at the annual meeting of the Solar Physics Division of the American Astronomical Society in Las Cruces, N.M. The researchers also detail their discovery in a paper to be published in The Astrophysical Journal Letters. Surfer waves on the sun? Another recent study of waves on the sun found "surfer" waves the size of the United States in the solar corona. These so-called Kelvin-Helmholtz waves, also discovered using data from SDO, could help astronomers understand how energy moves through the solar atmosphere. "One of the biggest questions about the solar corona is the heating mechanism," said solar physicist Leon Ofman of NASA’s Goddard Space Flight Center in Greenbelt, Md., and Catholic University, Washington. "The corona is a thousand times hotter than the sun's visible surface, but what heats it up is not well-understood. People have suggested that waves like this might cause turbulence which cause heating, but now we have direct evidence of Kelvin-Helmholtz waves." That research was published online on May 19 in the Astrophysical Journal Letters.